Some 13-ounce packages of Chewy Chips Ahoy cookies are being recalled in the United Sates Mondelēz Global LLC due to the possibility that an unexpected solidified ingredient showed up in some products. Consumers are being warned not to eat the cookies in some Chewy Chips Ahoy packages after the company that makes them issued a recall on Saturday. Some 13-ounce packages of Chewy Chips Ahoy cookies have been voluntarily recalled by Mondelēz Global LLC because parts of "an unexpected solidified ingredient" may be found inside, the company said in a recall notice. Mondelēz has received reports of potential adverse health effects, it said, though it didn't elaborate on what they might, or what the ingredient is that may have solidified unexpectedly. "Consumers who have this product should not eat it," the recall notice said. The cookies were sold nationwide. Their packages can identified by the UPC number 0 44000 03223 4 and the "use by" dates of 07SEP2019, 08SEP2019, 14SEP2019 and 15SEP2019. 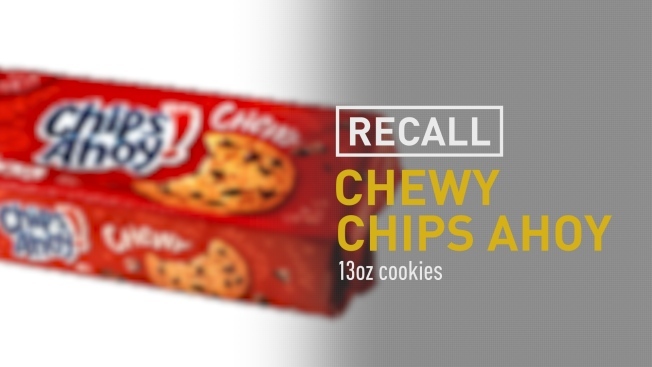 No other Chips Ahoy products are affected by the recall. NBC has reached out to Mondelēz for information for more details on the recall. Anyone with questions can reach the company with questions about the recall any time of day at 1-844-366-1171. Mondelēz Global LLC is part of Mondelez International, Inc., a publicly traded corporation that owns a variety of snacking brands, including Oreo, Cadbury and Toblerone.